Immunogen: Synthetic peptide corresponding to the sequence near the C-terminus of yeast Hsp104. 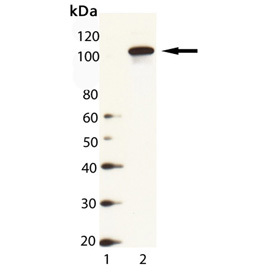 Application Notes: Detects a band of ~104kDa by Western blot. Scientific Background: The 104 kDa yeast heat shock protein (Hsp104) is a cytosolic member of the Hsp100 family of proteins. Hsp104 cooperates with Hsp40 and Hsp70 co-chaperones in yeast in the reactivation of heat-damaged proteins. Hsp104 is also critical for the establishment and maintenance of the [PSI] prion phenotype in Saccharomyces cerevesiae.